No, it's not Picasso with a voluminous hairstyle. It's once again the chicken-and-egg story of music from West African and Cuba. Which style has had the most influence on the other? Tie your head in knots trying to sort that out. Then pop in this marvelous new album and let it sooth the worry lines off your face. Seriously, this is sublime music made by master musicians from both sides of the Atlantic. 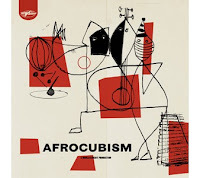 The AfroCubism project brings together Eliades Ochoa (guitar and vocals), Toumani Diabate (kora), Bassekou Kouyate (ngoni), Kasse Mady Diabate (vocals), Djelimady Tounkara (guitar), and Fode Lassana Diabate (balafon) in an Afro-Cuban tour de force. Despite the numerical superiority of the Africans, the overall vibe tends toward the Cuban. But hearing Cuban folk music played with balafon and kora is a special treat, though the instruments blend so well you might not hear the uniqueness if you weren't paying attention. "It was as though the musicians had been holding back their ideas and energy for that moment," says producer Nick Gold. "After we'd waited so long, it all came together remarkably easily and spontaneously. The group had never played together before but the music just poured out and it continued to flow over the next few days." Seventeen songs were recorded in five days, with all the musicians playing together "live" in one large room. A second session was convened some months later and produced a further nine songs. Fourteen of these songs made it onto this album, from the sultry "Al Vaivén De Mi Carreta" to the swinging "Mariama," co-written by Ochoa and Kouyate. Don't try to separate Cuba from Mali; after generations of cross-pollination, this musical heritage has finally flowered into this single sublime album. Enjoy.